Whether you’re looking to sing your favorite cowboy tune or belt out a beloved metal ballad, there are plenty of spots in Montana where you can do it—usually with a good, strong drink in your hand (or on a nearby table). These are our favorite karaoke bars for crooners in Montana. When you just need to sing in the state’s biggest city, take your lungs over to the Red Door Lounge and pick up the microphone. The Red Door hosts karaoke every night of the week (except Sundays) at 9:30 p.m. You can even warm up with open mic comedy a couple nights a month. Folks in the Missoula area can get their karaoke fix two nights a week—Wednesday and Thursday—at the Fraternal Order of Eagles Club. There’s no cover charge, and they boast a catalog of thousands of songs that include both current songs and classics. They even host the Rocky Mountain Regional Karaoke Contest, in which the winner can walk away with $1,500. Crooners on the Richest Hill on Earth can channel their inner Hank Williams (or Lucinda Williams or Wendy O. Williams) at Cinz Bar in Butte. In addition to live music, daily drink specials and other regular events like pool tournaments, Cinz bar hosts karaoke every Friday and Saturday night. Another place where you get a regular karaoke fix in Billings is Crystal Lounge Casino. Crystal Lounge hosts karaoke every single night of the week from 9 p.m. until 2 a.m. Prizes and regular events throughout the week keep things interesting, and everybody who sings gets a two-for-one drink card after their first song of the night. In the capital city of Helena, Hap’s Bar has been a favorite watering hole for more than eight decades. In addition to a conveniently-located, next-door laundromat, Hap’s also feature karaoke four nights every week, Wednesday through Saturday. Toss in a load of laundry, grab a drink and belt out a tune or two while you wait—but don’t forget to switch loads! In the Flathead Valley, the Blue Moon Nite Club has welcomed “anyone with a thirst and a wallet” for almost half a century. Every Wednesday and Thursday, this Columbia Falls fixture also welcomes folks who just need to sing—during the summer, you can check out a bit of the weekly Blue Moon Rodeo before taking the stage. The Badlander, an entertainment complex in Missoula, is another go-to spot for karaoke in Southwest Montana. In addition to the occasional special open-mic event, as well as live music, the Badlander hosts “Kraptastic Karaoke” every Wednesday night. You can fuel your singer passions with a $6 pitcher of PBR, to boot. In the eastern part of the state, you can find a spot to sing until your heart’s content at Bucking Horse Saloon and Casino in Miles City. Be sure to call or check the Bucking Horse’s Facebook page to find out when they have upcoming karaoke events. Aspiring vocalists in Bozeman can polish their talents at the Eagles Club and Ballroom. 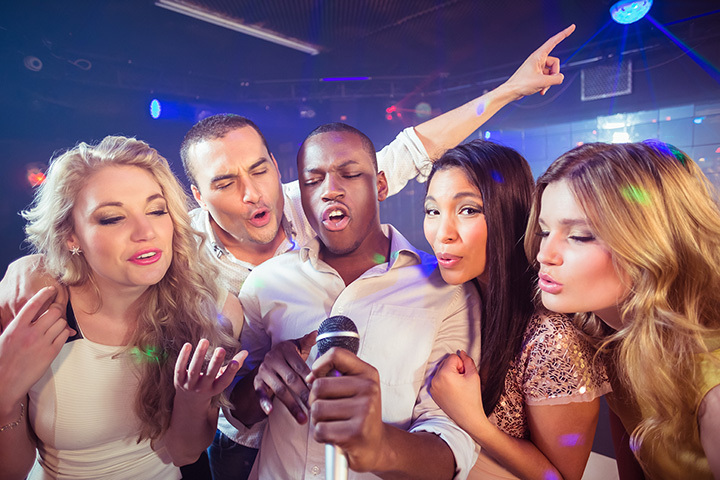 The Eagles Club hosts regular karaoke nights, usually with Sunrise Entertainment and usually on Thursdays. Call or check their social media to find out when you can pick up the mic and show everybody what you’ve got. In Great Falls, Cowboys Bar and Museum—operated by the Montana Cowboy’s Association—is the place to go and do your best Gene Autry imitatiion. Located in a 1930s-era log cabin, Cowboys Bar is the perfect venue for lonesome cowpokes to impress the fillies with their vocal stylings.